Thinking about using invoice finance or factoring? An obvious place to start would be a google search, perhaps something like "best invoice finance company". Simple and likely to generate a simple answer? You may think so but the result is likely to be more misleading than helpful. Our latest count revealed that there are 100 separate organisations providing invoice finance in the UK. The honest answer to that question is that there is no single invoice finance company that is better than all the rest. However, there may be one that will be the best match for your company, depending upon your circumstances and what you are looking for. For example if you are a construction sector company, raising applications for payment, rather than invoices - you will be wasting your time with many of the mainstream providers - many don't handle construction sector companies. You will need a specialist that operates within the construction sector. Similarly, if you are a recruitment company, but you only want the funding for 3 months to get you through a cash flow lull caused by a large project, again many of the mainstream providers won't be able to help (they may want a year's contract with you), so you would need to seek a selective invoice finance company that will allow you to use the facility for a short period. Again, if you want a factoring facility (where you receive prepayments and a credit control service), there is no point talking to the invoice discounting specialists, as they don't offer credit control. If you wanted bad debt protection, yet again not everyone offers that type of facility so you would need a specialist. This is why at FundInvoice we have undertaken the research to establish which providers are likely to be able to help with different segments, what their service levels are likely to be and how their prices are likely to compare. We can they draw on this research to match a provider with your requirements - but there is no single company that will be best for everyone. Search Online For The "Best Invoice Finance Company"
Returning to my online search for the "best invoice finance company", to demonstrate how misleading this type of search can be, I used Google and this was what I found. The top 4 results were all paid inclusion adverts for comparison sites. These are prioritised according to who bids the most to Google in order to reach the top of the paid advertising rankings. Advertisers bid for each click through that they receive. Therefore there is no reason to believe that these will be the best match for your search, as they are not ranked according to relevance, rather the amount that each advertiser is willing to pay. Now Google makes it pretty clear that the top result is Bibby, right? The presentatation of this list implies that, but when you look at the underlying site, the list is not offered as an ordered list of the best providers. In fact the site that ranks top in Google, and from which this list is drawn, is a broker that is part of a firm of insolvency practitioners. Their site, when visited, explains that they deal with 50 lenders, and it goes on to list them (as per the list above) but the actual site makes no mention of which is best or better. It just appears to be a list of their invoice finance partners, their site even explains that as a starting point they have set out a list of the larger independent providers. Their site is well optimised for the search phrase we were searching for and they may be able to select from this list for you, however the list is not the answer that it would appear to be at first glance. 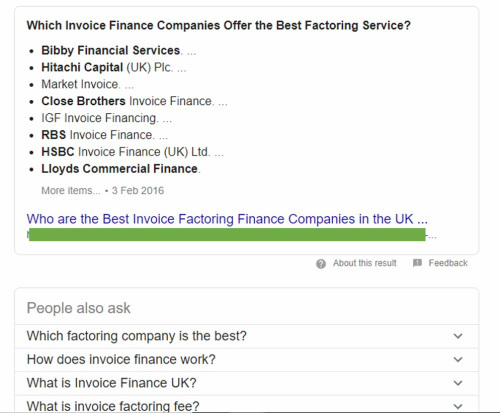 It is ironic to note that where the title in the search results includes the phrase "best factoring service", some of those listed don't even provide factoring - only invoice discounting. So as you continue down the Google organic results the next 3 results are all comparison sites/brokers offering answers as to the best invoice finance companies via a list of between 6 and 29 companies. The first offers a list of the 10 best factoring companies. The top of their list is Ashley Business Finance. The company was renamed Ashley Commercial Finance before it was acquired and absorbed into the Ultimate Finance Group branding. 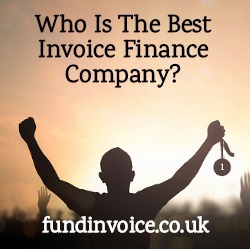 The second result offers the top 29 UK invoice finance companies. It explains that it uses a September 2018 comparison of their websites to show the maximum percentage of invoice value. Close Brothers are the first entry on the list, but it doesn't state if the list is in any particular order of merit. The list can be ordered by the user according to maximum funding percentage. Anyone working within the sector will realise that maximum percentage of invoices funded is not a great measure for comparison in order to find "the best". Firstly, it is not specific to your type of business or circumstances, and quoted funding rates are often lower than those that are mentioned in promotional material, which are typically the maximum to which a provider will go. This metric also ignores product offerings, service levels, costs and risk appetite, which can be important. There is also no mention of what it takes to make the top 29 list on this site. The next result is a broker/comparison site showing the top 6 invoice finance companies. The top result is Hitachi. However, when you look at how the results are ordered, the site explains that the order is based on the "most unique clicks in the last 30 days" - again not the metric that is really relevant to finding the best provider. The next organic result is the site of one of providers, who have ranked well for this search term. So you can see the issue here, what first appears as well ordered information can be based on all sorts of metrics that skew the results. No body can give you a definitive answer as to who is the best invoice finance company. The best option is to find a reputable broker, explain your circumstances to them and let them recommend providers that are likely to be suited to your circumstances. If we can help you please call us on 03330 113622.